Home » From the Studio » Be a Voice for Art Education! 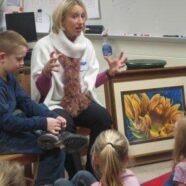 I continue to be a voice for art education. I embrace and support art education and its importance. At times, individuals may not correlate the dynamic connection. Through my personal philosophy and as a parent, a educational fine arts program provides a wide-range range of skills and abilities enhancing today’s children and teens. Why is art important to my child? The fine arts offer a child the ability to increase motor skills, early literacy, imagination, concrete to abstract thought and general creativity. These little developments derive from artistic activities at home to a professional education setting. Furthermore, did you know early creative opportunities produce a platform for growth and success throughout a child’s education and life experiences? Whether it is free play to local community activities, childhood exposure to the creative arts enhances brain functionality and mental activity. According to Sousa (2009), “During the brain’s early years, neural connections are being made at a rapid rate. Much of what young children do as play — singing, drawing, dancing — are natural forms of art. These activities engage all the senses and wire the brain for successful learning.” Artistic and phonetic activities are vitally important to express individuality in children. Through my own experience, I witnessed a defining proposal for a school system fine arts program budget cut. At the time, my son was in the first grade. Furthermore, children are quite in-tune with daily topics unfolding around them. When your child comes home from school and asks, “Mom what is going to happen to my art and music classes? Are my art and music teachers going to be at school next year?” His concerns became my concerns. As a parent, what do you do? You listen-up, perk-up and get-up to act for your child’s advocacy. Next, you become their voice, a voice for others and turn into an advocacy warrior. In addition, I offer plenty of my own support and action experience throughout my educational and professional career. I am one individual with one voice, but I WILL use my voice on others behalf. Maybe it is in my nature. Maybe it resounds through my many involvements and support in the educational system. It is and will always be MY PASSION. Are you a rock star? Whether you have your own children or children in the family, shine for them. Sing like a rock star. Dance with enthusiasm. Paint like a modern master. Read like a philosopher. Become a rock star for the arts and early literacy. What can YOU do? You don’t have to take the world by storm, but you can if you have the passion. It is so easy to start small and be active in your community. There are a variety of steps from volunteering, joining a club or organization to providing “free creative play” outlets at home. Personal engagement goes a long way. In conclusion, the point is to provide and offer a personal service. Provide a voice, your voice, for future generations. I guarantee children from all walks of life will thank you for it.